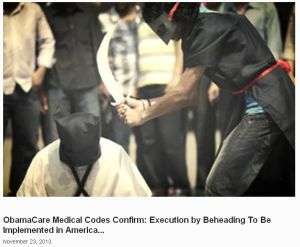 "Obamacare Medical Codes Confirm: Execution by Beheading To Be Implemented in America." By Louis Jacobson on Thursday, January 2nd, 2014 at 5:18 p.m.
One blog published an article titled, "ObamaCare Medical Codes Confirm: Execution by Beheading To Be Implemented in America." We took a closer look. 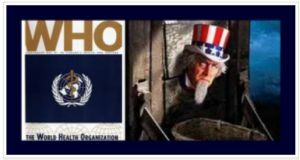 One blog used this image of Uncle Sam in the guillotine to dramatize the threat from Obamacare-linked beheadings. We’ve heard people give lots of reasons for opposing Obamacare. But until a reader sent us some Internet links recently, we hadn’t realized that one of the fears being spawned by Obamacare was that it could usher in legal beheadings across America. The reader pointed us to a variety of blog posts, such as one headlined, "Obamacare Medical Codes Confirm: Execution by Beheading To Be Implemented in America." As if this wasn’t scary enough, this post was accompanied by a photograph of a masked executioner swinging a curved sword downward, just inches from the neck of the condemned. Anderson cites a document known as ICD-9, which refers to the ninth update of the "International Classification of Diseases." ICD-9 is a lengthy list of medical conditions and causes of death published by the World Health Organization and used in the United States by medical professionals for billing purposes and by health statisticians who study causes of death. One of the categories in ICD-9 is this one: "Legal execution: All executions performed at the behest of the judiciary or ruling authority (whether permanent or temporary) as: asphyxiation by gas, beheading, decapitation (by guillotine), capital punishment, electrocution, hanging, poisoning, shooting, other specified means." Anderson wrote that the connection between the coding system, Obamacare and legal execution would "make any American’s hair stand up on the back of their neck." But if anything, subsequent posts on other websites destroyed any nuances she included. One even accompanied a blog post with a drawing of Uncle Sam with his head in a guillotine. Here’s the reality about what the World Health Organization’s coding system does and doesn’t do. As PolitiFact noted in a previous fact-check, the United States medical system currently uses ICD-9 and is in the process of transitioning to ICD-10. Doctors’ offices use the codes to fill out Medicare and Medicaid claims, among other things. Their billing and practice management software is based on them. Their employees are trained to use them. The transition to ICD-10 is somewhat controversial, though not because of beheading. The American Medical Association says that depending on the size of the medical practice, it’ll cost $83,290 to more than $2.7 million to switch. Doctors are dealing with so many other expensive regulatory changes, the association has begged since 2011 to delay or give up on the switch altogether. But the federal government is requiring American doctors, and any organization covered by the 1996 health care law known as HIPAA, to switch to ICD-10 by Oct. 1, 2014. That’s because because ICD-9 has outdated medical terms and not enough detail for accurate claims processing, according to the Centers for Medicare and Medicaid Services. In fact, the rest of the world began switching to the new codes 20 years ago, and now most developed countries now use it. • A doctor can’t bill an insurer for a beheading. Obamacare -- a program that addresses health care for the living -- doesn’t have anything to do with beheading. The "beheading" category in the code is for the purposes of compiling death statistics, something the Centers for Disease Control and Prevention handles. The CDC uses the codes to make apples-to-apples comparisons with other countries. "These coding rules improve the usefulness of mortality statistics by giving preference to certain categories, by consolidating conditions, and by systematically selecting a single cause of death from a reported sequence of conditions," the CDC says. • The "beheading" coding category long predates Obama. The coding for "beheading" has been standard in the U.S. since at least 1979, when the CDC adopted ICD-9 for the purposes of compiling death statistics. At that time, Obama was graduating high school. • There is no legal beheading in the United States today, and the president couldn’t change that even if he wanted to. The military uses only lethal injection, and the federal government essentially does as well. Lethal injections are also used in 35 states, with a dwindling number of states using electrocution, the gas chamber, hanging or a firing squad. Most of the methods other than lethal injection are secondary methods, either by choice or necessity. No state uses beheading. More importantly, as this summary makes clear, each state chooses its own method of execution, making the decision of what method to use beyond the reach for the federal government. The reason beheading is in the code at all is because it is a common method of execution in Saudi Arabia and some other countries, and is practiced by some militant and terrorist groups. So for an international coding system, beheading, for better or for worse, is needed. Bloggers have recently offered posts headlined like this one: "Obamacare Medical Codes Confirm: Execution by Beheading To Be Implemented in America." But the coding system in question long predates Obama, and the "beheading" classification is only relevant for death statistics, not for insurance billing that would be under Obamacare’s purview. Finally, the beheading code is for statistical purposes, not for setting policy. Any change in legal execution methods would have to be approved by the states, not by the federal government. Bloggers, in a game of telephone, have turned a questionable claim into a ridiculous one. Pants on Fire! Published: Thursday, January 2nd, 2014 at 5:18 p.m.